To support the campaign we’re organising a social media push ahead of the critical committee hearing in the Lords on Wednesday 10 December 2014. We are calling on all friends and supporters who have a twitter account to send a tweet or more to help us demonstrate the breadth of support for this call. Introduction: On December 8th a coalition of corporate accountability and anti-slavery organisations are organising a day of social media to increase pressure on the government to introduce meaningful amendment to the Modern Slavery Bill. We are asking groups who support our demands to join us in tweeting [and other social media] at No 10 on December 8th ahead of the Lords Committee stage [on the 10th]. Ensure that there’s strong monitoring and enforcement so companies comply. Make reporting part of the company directors’ report to ensure companies take it seriously at the highest levels. Why December 8th? The bill is currently going through committee stage in the House of Lords – and we expect the amendments we support to be discussed on Wednesday 10th December. This is a crucial stage where the government will decide whether it will improve the bill or not. Cross party Lords, with support from across the house, have tabled amendments to give the government the opportunity to do just that. It’s the best [but not the only] chance to get the bill improved. What can you do? 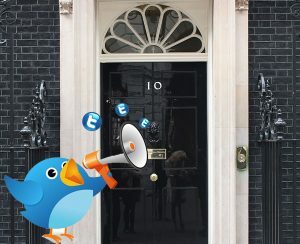 We would like as many organisations and their supporters to copy [or adapt] our suggested tweets and tweet @Number10gov. How does it work? In order to have as much coherence as possible between all the tweets we’d like everyone who tweets to use the hashtag #modernslavery and also to target @Number10gov – this will we think give us the best chance of making an impression.You can choose from our list of suggested tweets below or adapt to suit your organisations. We’ve also included a number of suggested hashtags that you can use. What Happens After? After the Committee discusses the amendment we’ll be looking to see what reaction the government makes and assess our next steps. We’ve currently scheduled some activism towards MPs in early January for when the bill returns to the commons and we’ll also be doing some media outreach for early January so please let us know if you’d like to be involved. http://bit.ly/TISCHoL – link to the briefing about the bill you might want to include in the tweets.